Gordie Howe, aka Mr. Hockey, had a serious stroke on the weekend and is believed to be in failing health. Howe was stricken in Lubbock, Texas, at the home of his daughter, Cathy. Other family members spent Tuesday en route to Lubbock. Helene St. James of the Detroit Free Press has more right here. The Moose Jaw Warriors had many people, including players, from their organization take part in a three-hour safeTALK presentation with Donna Boyer of the Canadian Mental Health Associated last week. Katie Brickman of the Moose Jaw Times-Herald sat through it and writes right here about what she heard and saw. This is important stuff. It’s doubtful that any WHL team is delving as deeply into analytics — aka fancy stats — as the Saskatoon Blades. 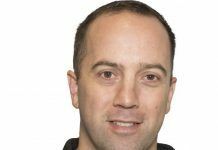 The Blades have hired Bruce Peter as their director of analytics. 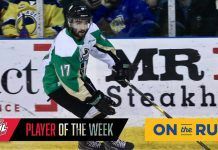 Daniel Nugent-Bowman takes a look right here at what Peter does and how the Blades are making use of his work. A shoulder problem has brought a premature end to the career of Lethbridge Hurricanes F Steven Alldridge. An 18-year-old native of Inuvik, N.W.T., Alldridge announced his retirement on Tuesday. . . . The Hurricanes acquired Alldridge, F Shane McColgan, then 20, and a second-round pick in the 2014 bantam draft from the Portland Winterhawks for G Corbin Boes, also 20, on Jan. 9. Alldridge, a Portland list player, was pointless in 24 games with the Winterhawks and 15 with the Hurricanes. He never did get into a game this season after undergoing surgery in late April. F Dalton Sward, 20, won’t play tonight as the Vancouver Giants play host to the Brandon Wheat Kings. 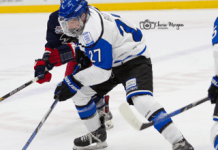 He suffered an undisclosed injury during a Saturday game with the host Victoria Royals. . . . 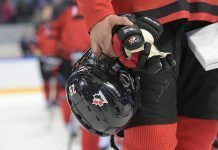 The Giants also will be missing F Tyler Benson and F Ryely McKinstry, both of whom leave today for the U-17 World Hockey Challenge in the Sarnia, Ont., area. . . . That will allow F Brendan Semchuk to make his WHL debut. Semchuk, from Kamloops, was the 10th overall pick in the 2014 bantam draft. 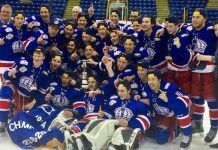 Semchuk is playing at the Okanagan Hockey Academy in Penticton, B.C. . . . Steve Ewen of the Vancouver Province has more on the Giants right here. In Victoria, D Ryan Pilon broke a 2-2 tie at 11:34 of the third period to lift the Brandon Wheat Kings to a 3-2 victory over the Royals. . . . Pilon has three goals this season. . . . The Wheat Kings, who play the Giants in Vancouver tonight, are 3-1-0 on a seven-game road trip. . . . Victoria F Axel Blomqvist had tied the game 2-2 at 16:55 of the second period with his fifth goal. . . . Czech F Richard Nejezchleb, playing in his first game of the season for Brandon, scored a PP goal in the first period. . . . Nejezchleb returned from the AHL’s Hartford Wolf Pack and had to serve a two-game suspension left over from last spring’s playoffs. Nejezchleb, 20, led the Wheat Kings with 32 goals last season, but his presence gives Brandon three imports. Either he, Latvian Rihards Bukharts, the team’s leading scorer who didn’t play last night, or freshman Russian D Ivan Provorov will be traded or released over the next few days. . . . Provorov, 17, had two assists last night. . . . Rob Henderson of the Brandon Sun has a game story right here. . . . 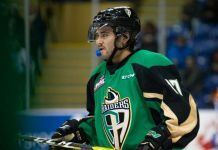 In Saskatoon, G Nik Amundrud made 30 saves to help the Blades to a 5-2 victory over the Moose Jaw Warriors. . . . F Ryan Graham led the Blades with a goal, his second, and two assists. . . . F Brayden Point scored twice for the Warriors, giving him eight on the season. . . . Saskatoon was 2-for-6 on the PP. . . . Saskatoon had F Nick Zajac back after he missed four games with a shoulder injury. . . . The Warriors, who were playing their fourth game in five nights, now have lost four in a row. They have scored five goals over their last five games. . . . Daniel Nugent-Bowman of the Saskatoon StarPhoenix has a gamer right here. . . . In Red Deer, the Rebels scored the game’s last three goals and beat the Medicine Hat Tigers, 5-3. . . . Rebels F Grayson Pawlenchuk tied the game 3-3 at 18:01 of the second period, with his fifth goal, and D Devan Fafard broke the tie, with his second, at 6:45 of the third. . . . Red Deer F Wyatt Johnson added insurance with his seventh goal. He’s on a three-game goal streak. . . . F Trevor Cox drew three assists for the Tigers (11-2-1), while F Cole Sanford scored his ninth goal. . . . Medicine Hat F Chad Butcher picked up an assist as he ran his point streak to 10 games, the longest in the league this season. . . . Besides losing the game, the Tigers lost a tire. Here’s a late-night tweet from Bob Ridley, the bus-driving radio man: “On way home. May take a few hrs longer. Flat tire on Q.E . 2 at Olds turnoff. Waiting for help.” . . . In Cranbrook, G Nick McBride posted his first WHL shutout to lead the Prince Albert Raiders to a 5-0 victory over the Kootenay Ice. . . . McBride stopped 29 shots. . . . 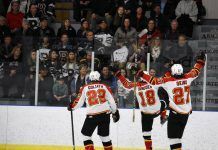 The Ice has been blanked three times this season and has scored only five goals in five home games. . . . D Josh Morrissey had a goal, his third, and two assists for the Raiders, while F Craig Leverton and F Jayden Hart each scored his sixth goal. . . . Hart, who had one goal in his first seven games, is riding a five-game goal streak. . . . Ice G Wyatt Hoflin stopped 41 shots. . . . At 3-12-0, the Ice is off to its worst start in franchise history. . . . The Ice, already without F Tim Bozon and F Jon Martin with undisclosed injuries, has lost D Tyler King for up to three weeks with an undisclosed injury. . . . Taylor Rocca of the Cranbrook Daily Townsman has a gamer right here. Bruce Luebke, the veteran radio voice of the Brandon Wheat Kings, reported Tuesday that freshman D Ivan Provorov will play for the Russian side during the Subway Super Series. 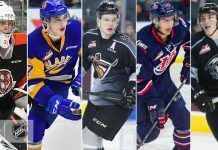 The Russians will play a WHL team on Nov. 10 in Saskatoon and Nov. 11 in Brandon. . . .
Regan Bartel, who calls the play of Kelowna Rockets’ games, tweeted Tuesday that G Jake Morrissey “was hurt in practice” and that they “have brought in” Michael Herringer, 18, to back up Jackson Whistle. . . . Herringer was traded by the Victoria Royals to the Saskatoon Blades on Sept. 17. However, the Blades later dropped Herringer from their list when they acquired G Nik Amundrud, 17, from the Everett Silvertips. Elliotte Friedman leads off with something about the Toronto Maple Leafs in his latest edition of 30 Thoughts. . . . It’s right here. My dad introduced me to Mr. Howe years agoDad: This is my son Scott. Robbie’s brother.Gordie: This one grow up closer to the fridge, Bob?